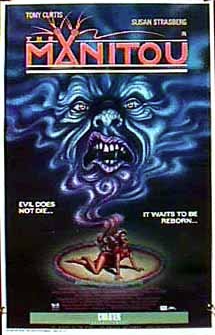 Some people might call William Girdler’s The Manitou a ripoff of The Exorcist, and in a sense they’d be right in that both involve possession of a sort. Then’s there’s the fact that Girdler’s film came five years afterwards, though other than that it’s a whole other animal and deserves revisiting. The movie, based on the novel by horror writer Graham Masterson, revolves around a woman named Karen Tandy (Susan Strasberg), who one day discovers that she has a tumor on her back. Which is a huge mindfuck in and of itself, never mind that the tumor ends up being the doorway–and by “doorway” I mean a full-sized human being grows on her back and eventually rips its way out long before Alien was even an idea for Walter Hill and David Giler–through which Misquamacus, a Native American sorcerer, would be reborn after 400 years. The premise of the movie is pretty goofy, which works in its favor because it makes it feel more original than it actually is. Misquamacus is also a midget, though I don’t recall if this is was due to a problem with the “birth” or if he was actually that short when he existed earlier. Which leads to perhaps the greatest problem with the movie, namely that you’re given little in the way of background on Misquamacus and why he does what he does when he makes a (re)appearance. I can understand why he might have an issue or two with white people, but such a hatred on general principal strikes me as a bit lazy, narratively speaking, which is why a prologue showing viewers a bit of his life leading up to his death would go a long way toward humanizing the character, or at the very least making him somewhat sympathetic. So that when he’s reborn in an over-the-top gory fashion, viewers will understand what could drive a man 400 years earlier to seek vengenace. And why Karen Tandy? I haven’t read the book in awhile, but I don’t recall that there was any rhyme or reason to her being chosen, which weakens the possession angle somewhat. Now suppose that her ancestors slaughtered Misquamacus and his people? That would link her to the Native American shaman, and while that wouldn’t justify what he was doing in the current day, it would at least makes what follows more logical. And it goes without saying that the effects need to be practical as possible. Though with today’s CGI, the battle between Misquamacus and the various Manitou would feel more cosmic and epic in scope–perhaps similar to that from Poltergeist: The Other Side–which would serve to further differentiate it from the original, as well as other films that share possession as central theme. (What’s interesting is that according to IMDB Burgess Meredith was in the movie, though I don’t recall him, though he also played Satan in The Sentinel, an awesome movie that will have its own write-up in the coming weeks). Posted in actors, directors, horror, Movies, novelization, The Unnecessary Remake Dept..Tagged Alien, Burgess Meredith, David Giler, Graham Masterson, Harry Erksine, John Singing Rock, Karen Tandy, Michael Ansara, Misquamacus, Native American, Native Americans, Poltergeist: The Other Side, Satan, shaman, Susan Strasberg, The Exorcist, Tony Curtis, Walter Hill, William Girdler.